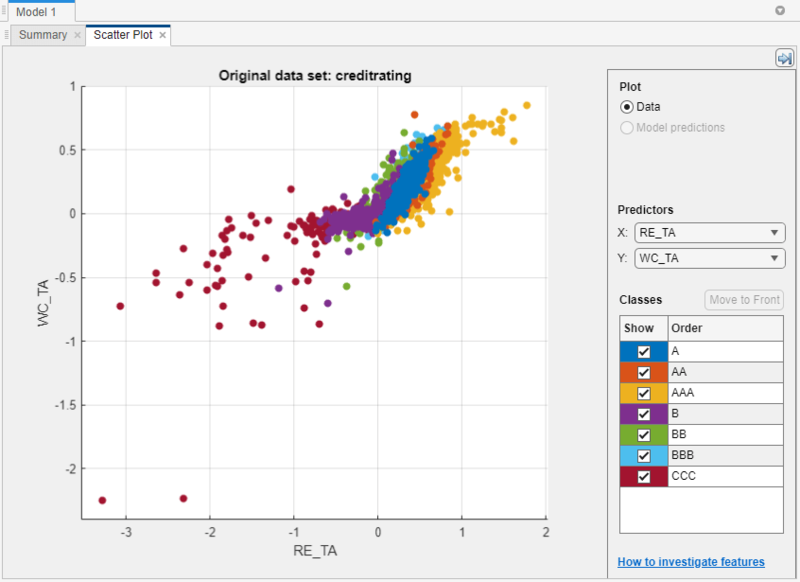 Use the credit rating data set in the file CreditRating_Historical.dat, which is included with Statistics and Machine Learning Toolbox™. Reduce the data dimensionality using principal component analysis (PCA). Train a set of models that support code generation for label prediction. Export the model with the minimum 5-fold, cross-validated classification accuracy. Generate C code from an entry-point function that transforms the new predictor data and then predicts corresponding labels using the exported model. Load sample data and import the data into the Classification Learner app. 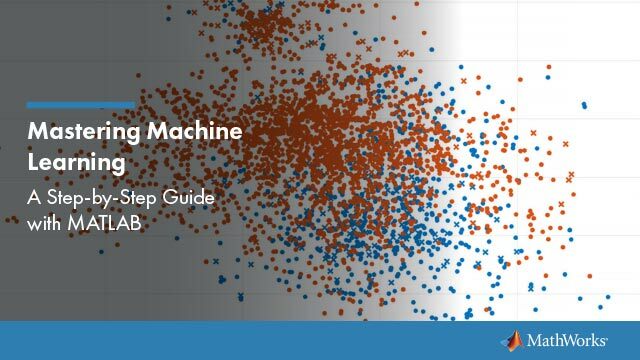 Review the data using scatter plots and remove unnecessary predictors. Use readtable to load the historical credit rating data set in the file CreditRating_Historical.dat into a table. On the Apps tab, click Classification Learner. In Classification Learner, on the Classification Learner tab, in the File section, click New Session and select From Workspace. In the New Session dialog box, select the table creditrating. All variables, except the one identified as the response, are double-precision numeric vectors. Click Start Session to compare classification models based on the 5-fold, cross-validated classification accuracy. Classification Learner loads the data and plots a scatter plot of the variables WC_TA versus ID. Because identification numbers are not helpful to display in a plot, choose RE_TA for X under Predictors. The scatter plot suggests that the two variables can separate the classes AAA, BBB, BB, and CCC fairly well. However, the observations corresponding to the remaining classes are mixed into these classes. Identification numbers are not helpful for prediction. Therefore, in the Features section, click Feature Selection and then clear the ID check box. You can also remove unnecessary predictors from the beginning by using the check boxes in the New Session dialog box. This example shows how to remove unused predictors for code generation when you have included all predictors. Enable PCA to reduce the data dimensionality. In the Features section, click PCA, and then select Enable PCA. This action applies PCA to the predictor data, and then transforms the data before training the models. Classification Learner uses only components that collectively explain 95% of the variability. Select the following classification models and options, which support code generation for label prediction, and then perform cross-validation (for more details, see Code Generation Support, Usage Notes, and Limitations). To select each model, in the Model Type section, click the Show more arrow, and then click the model. After selecting a model and specifying any options, close any open menus, and then click Train in the Training section. Under Support Vector Machines, select All SVMs SVMs of various complexities and using various kernels. Complex SVMs require time to fit. 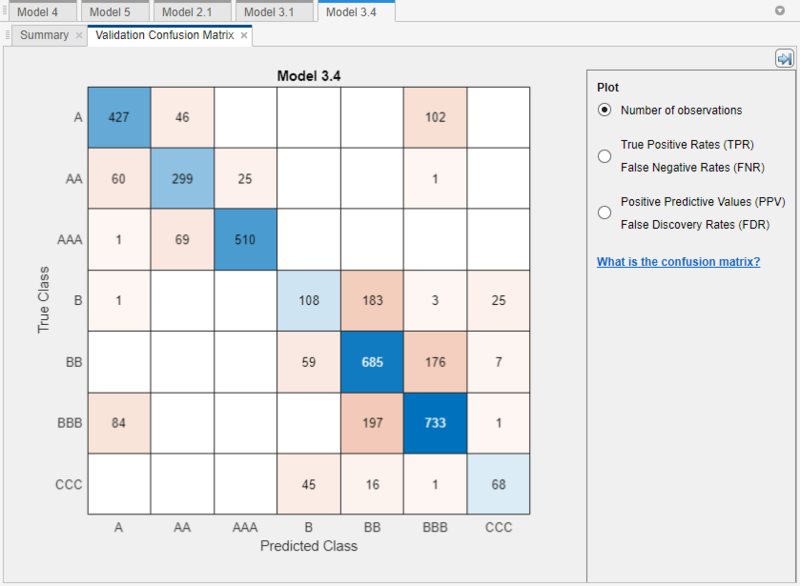 After cross-validating each model type, the Data Browser displays each model and its 5-fold, cross-validated classification accuracy, and highlights the model with the best accuracy. 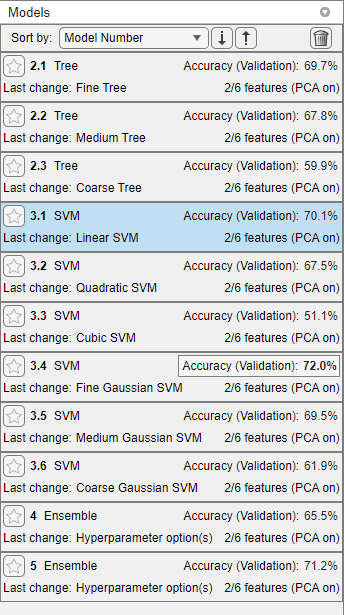 Select the model that yields the maximum 5-fold, cross-validated classification accuracy, which is the error-correcting output codes (ECOC) model of Fine Gaussian SVM learners. With PCA enabled, Classification Learner uses two predictors out of six. In the Plots section, click Confusion Matrix. The model does well distinguishing between A, B, and C classes. However, the model does not do as well distinguishing between particular levels within those groups, the lower B levels in particular. Export the model to the MATLAB® Workspace and save the model using saveCompactModel. In the Export section, click Export Model, and then select Export Compact Model. Click OK in the dialog box. The structure trainedModel appears in the MATLAB Workspace. The field ClassificationSVM of trainedModel contains the compact model. At the command line, save the compact model to a file called ClassificationLearnerModel.mat in your current folder. Prediction using the object functions requires a trained model object, but the -args option of codegen does not accept such objects. Work around this limitation by using saveCompactModel and loadCompactModel. Save a trained model by using saveCompactModel. Then, define an entry-point function that loads the saved model by using loadCompactModel and calls the predict function. Finally, use codegen to generate code for the entry-point function. Preprocess new data in the same way you preprocess the training data. Specify the indices of predictor variables that you removed while selecting data using Feature Selection in Classification Learner. Extract the PCA statistics from trainedModel. Save the model parameters to a file named ModelParameters.mat in your current folder. An entry-point function is a function you define for code generation. Because you cannot call any function at the top level using codegen, you must define an entry-point function that calls code-generation-enabled functions, and then generate C/C++ code for the entry-point function by using codegen. Because C and C++ are statically typed languages, you must determine the properties of all variables in the entry-point function at compile time. Specify variable-size arguments using coder.typeof and generate code using the arguments. Create a double-precision matrix called x for code generation using coder.typeof. Specify that the number of rows of x is arbitrary, but that x must have p columns. For more details about specifying variable-size arguments, see Specify Variable-Size Arguments for Code Generation. Generate a MEX function from mypredictCL.m. Use the -args option to specify x as an argument. codegen generates the MEX file mypredictCL_mex.mexw64 in your current folder. The file extension depends on your platform. Verify that the MEX function returns the expected labels. Remove the response variable from the original data set, and then randomly draw 15 observations. Predict corresponding labels by using predictFcn in the classification model trained by Classification Learner. Convert the resulting table to a matrix. The columns of testsample correspond to the columns of the predictor data loaded by Classification Learner. Pass the test data to mypredictCL. The function mypredictCL predicts corresponding labels by using predict and the classification model trained by Classification Learner. Predict corresponding labels by using the generated MEX function mypredictCL_mex. Compare the sets of predictions. isequal returns logical 1 (true) if all the inputs are equal. predictFcn, mypredictCL, and the MEX function return the same values.